Amjad Sabri assassination: Why do the Islamic jihadis hate the Sufis so much? Not many might know that in 2014 the Islamabad High Court had issued a notice in a blasphemy case to Amjad Sabri, one of the finest qawwals of Pakistan, along with two TV channels for the playing of a qawwali during a morning show. 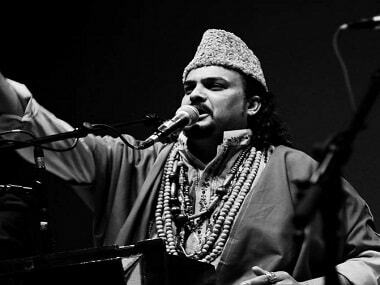 Amjad Sabri was gunned down in Karachi on Wednesday afternoon and Tehrik-e-Taliban Pakistan’s Hakimullah Mehsud group has accepted responsibility for the attack through its spokesperson Qari Saifullah Mehsud. Qawwali is one of the musical forms — and perhaps the most important one — through which Sufism speaks. Most people associate Sufism with Shias but ‘soft’ Sunnis, who often share religious observances with Shias, also revere Sufi saints and visit their shrines. In Purifying the Land of the Pure: Pakistan’s Religious Minorities, Farahnaz Ispahani tells us that between 2001 and President General Pervez Musharraf’s resignation in 2008, at least 713 Shias were killed and 1,343 wounded in eighty-six terrorist attacks. Then, between 2009 and 2015, 1,659 Shias were killed and 2,950 injured in 320 incidents of terrorism. Sufi shrines have been regularly attacked in Pakistan. On 1 July 2010, two suicide bombers killed 42 people at Data Darbar, a 900-year-old shrine which houses Sufi saint Data Gunj Bakhsh Ali Hajveri’s grave, in Lahore. People were astonished when Pakistani media, instead of blaming the jihadi terrorists whose hostility to Sufis was well known, tried to put the blame on the country’s alliance with the United States and a section of it even tried to accuse the Ahmadis of the attack. Why do the Islamic jihadis hate the Sufis so much? The simplest explanation is that while the Islamic zealots are inspired by sectarian hatred and glorify divine retribution, the Sufis glorify divine love and compassion. The jihadis accentuate religious differences and rely on violence but the Sufis spread the message of wahdut al-wajood (unity of being) and bring comfort to people. They are as different from each other as chalk is from cheese. An important facet about Sufism is that it has been, to a very considerable extent, responsible for the spread of Islam in the Indian subcontinent. Little wonder that the Islam as it is practised in India, Pakistan and Bangladesh is very different from the one practised in the Arab countries. However, as the Islamic jihadis are inspired and financed by the Saudi Wahabis, they maintain that the Wahabi version is the only authentic Islam and the Sufis are essentially apostates and heretics. These days the word Sufi is being so widely used as a prefix that it has almost lost its original meaning. We now have sufi kathak, sufi pop, sufi hip-hop, sufi rap and so on. However, its shortest definition is that it is Islamic mysticism coupled with asceticism and the Sufis consider Prophet Muhammad as the first Islamic mystic. As the early Muslim mystics used to wear a loose robe made of suf (Arabic word for wool), people started calling them Sufi. They used music and dance to enhance their spiritual experience and getting into a state of mystical trance. After Muslim invaders had conquered large parts of India, Sufi saints also started arriving here. As they did not differentiate between rich and poor, Muslim and Hindu, upper castes and lower castes, they soon became very popular and people started joining their faith. Musical soiree or sama became an important event at their khanqahs. The process of assimilation of Indian and Persio-Arabic music had begun under the famous Suhrawardi Sufi saint Shaikh Bahauddin Zakaria (1191-1267) whose khanqah would host sama where singers would attempt this assimilation. It is said that Multani, one of the most popular ragas in the Hindustani classical music, was created by Bahauddin Zakaria. During the 13th century, Delhi began to emerge as a great centre for the Chishti silsila or branch of Sufism. Hazrat Nizamuddin Chishti, who was called the sultan of the soul, was by far the most influential Sufi saint. Until recently, residents of Old Delhi used to call not only his dargah but the entire locality of Nizamuddin Basti as Sultanji. Nizamuddin and his disciple Amir Khusrau played a most important role in the development of many musical forms of which qawwali became the most popular. Under the reign of the Delhi Sultans qaul, naqsh, tarana, nigar and ghazal became part of the repertoire of Indian singers and qawwali took shape. The qawwals became an integral part of the royal court as well as the Sufi centres and they began to base their singing on the raga-raginis as well as folk music, thus creating a wonderful musical amalgam that went very well with the syncreticism of the Sufi saints. Qawwals also came to be known as Delhi singers. It is said that Nizamuddin Aulia was so fond of raga Poorvi that he would want to listen to it almost every day. A khayal bandish composed by Amir Khusrau in his honour is still sung by Hindustani classical vocalists in raga Poorvi. Qawwali reminded people of Hindu kirtans and became very popular among the masses and the ruling elite alike. The clans of qawwals became very well known and their descendants were called qawwal-bachcha. It is widely maintained that the qawwal-bachchas are the creators as well as popularisers of Khayal that eventually deprived dhrupad of its primacy and became the most important genre in the field of Hindustani classical music. Many great qawwals emerged during the last century in the Indian subcontinent. They included Jafar Husain Badayuni, Warsi Brothers, Habib Painter, Shakila Banu Bhopali, Wali Muhammad, Nusrat Fateh Ali Khan and Sabri Brothers (Ghulam Farid Sabri and his younger brother Maqbool Ahmed Sabri). Of them, while Habib Painter, Wali Muhammad and Shakila Banu Bhopali excelled in the popular form of qawwali, Jafar Husain Badayuni, Warsi Brothers, Wali Muhammad, Nusrat Fateh Ali and Sabri Brothers managed to sing both the traditional qawwalis as they used to be sung at the Sufi khanqahs and the popular qawwalis that would strike an instant rapport with the masses. Top qawwals had the proper training in voice culture and their expertise in alap as well as taans was of such high order that they could compete with any khayal singer. They also excelled in layakari. Amjad Sabri was the son of Ghulam Farid Sabri and had become over the years one of the most sought after qawwals. He had adapted himself and his art to the changing times and was very popular among young listeners. His most memorable qawwalis were Tajdar-e- Haram, Bhar Do Jholi Meri and Mera Koi Nahin Hai Tere Siwa. His assassination is a reminder that when religious bigotry takes over, nations self-destruct. 1Amjad Sabri assassination: Why do the Islamic jihadis hate the Sufis so much?